Point Guard: 5'7" to 6'7"
Shooting Guard: 5'10" to 6'8"
Small Forward: 6'3" to 6'10"
Power Forward: 6'5" to 7'0"
Unlike in NBA 2K15, your player's height will be a factor on how fast they run on the court. If you choose to be a tall point guard, chances are smaller PGs will outrun you. 2K Sports didn't mention anything about weight distribution so it seems like it's not a big factor this year. Also, there will be three new playing styles that will determine your key skills: inside, balanced and outside. Choose the position and play style that best fits how you like to play. You can watch the replay of the 2K live stream below to catch all the details. We are 2 weeks away from the launch of NBA 2K16 on PS4, Xbox One, PC, PlayStation 3 and Xbox 360. 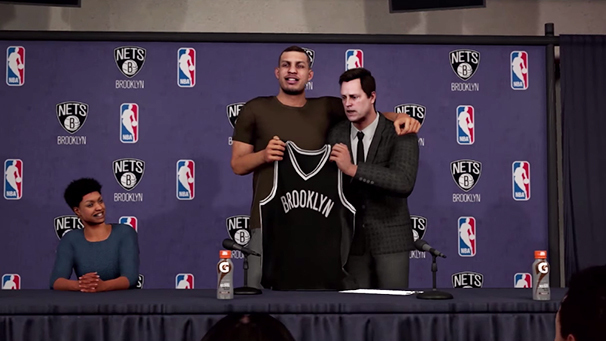 Check out our NBA 2K16 page for more updates, screenshots and videos.